Jon Morrow: 4 Tricks That Make Content Go Viral. Every Time. You wrote a blog post, hit publish and waited for an hour but you only saw few views on the stats. You know your topic’s pretty interesting and your writing’s nice, but why can’t your post seem to go viral no matter what you do? If you’re in this kind of rut, then this month’s Internet Marketing Party is for you. We’ve invited the CEO of Smart Blogger — the one and only JON MORROW — to tell us how to attract loyal readers, get more traffic and become a respected authority in your niche. Jon is going to give us amazing four tricks in making your content go viral. 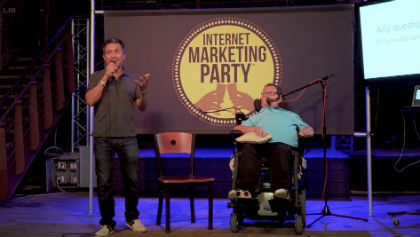 Who knows, maybe after attending this IMParty event with Jon, you’re content will just be the next big thing? !